[tweetmeme]Guest post from Nick Smith, author of Digital Wedding Secrets – a guide solely focused on the wedding photography and its business. If wedding photography is your passion too then Sign Up to its RSS or the FREE Digital wedding newsletter to receive wedding photography tips in your email. For many, Wedding Photography is the “pays the bills” aspect of photography, and therefore it might get short shrift on the respect meter because of the seemingly lack of “excitement”, but as my friend in the movie business says, “if you take the job, you do the job” and that means no griping. And honestly, there is a compelling aspect to wedding photography, let’s take a look, shall we? The truly interesting thing about Wedding Photography is that it has an editorial aspect to it as well as a photo-journalistic aspect to it (or at least you should position yourself as a photographer who offers a blend of both). This dual nature enables you to provide a premium product… with a premium price. While it goes without saying bringing two cameras to a wedding is the minimum ideal way to go. However, the true question is what two cameras to bring? I’m going to suggest a dSLR and a Rangefinder. Canon and Nikon make some extraordinary dSLRs and the higher end Prosumer models can easily handle nearly every situation conceivable for wedding photography. Obviously Pentax and Olympus make quality product, too, but Canon and Nikon are the two heavy weights. dSLRs provide you with so much versatility in lens choice and other accessories. But there are few specifications that you might want to consider (either when renting a second or third camera, or buying a second camera, and possibly trading in one of the cameras that you do have) to ensure that you don’t miss a shot. The camera’s recycle time and burst fps are important factors to weigh, as well as what type of flash units the camera can accommodate (i.e., a High Sync Flash unit). It’s important to use a full-frame dSLR, this is pure an aesthetic bias on my part, but you want to be able to use as many lenses as are available in your camera manufacturer of choice’s line. Sure you could miss out of the fully computer-controlled lenses, but you might have a favorite lens that was for a film camera. Most people will do well with two dSLRs, one fitted with a wide angle zoom (perhaps a 17mm-35mm), and the other with a telephoto zoom (probably a 85mm-200mm). This combination will enable you to quickly jump back-n-forth for group shots and tighter more intimate shots… without having to swap lenses, and perhaps miss a crucial shot. Why a rangefinder?, you ask. Simple, these most innocuous of cameras allow you to get extraordinarily candid and intimate shots that you might not otherwise be able to get with a dSLR. The level of intrusion that an dSLR causes can ruin the spontaneity of precious moments; not to mention that some people act a fool when they see a camera in active position. Now I wouldn’t say that these cameras really fallen out of favor, more like they have become the ultimate niche photographic item. And the granddaddy of them is the Leica M7 or its digital cousin the M9 (Leica’s newest, most state-of-the-art digital camera). The unparalleled image quality that these cameras provide are worth taking the time to learn the unorthodox focusing method. Leica’s new M9 is an AWESOME digital camera with a full-frame (24mm x 36mm) image sensor and captures images in a high-density RAW format. And because of the full-frame image sensor,you can effectively use any of the Leica lenses from the past 30 years… and those are perhaps the lenses on the planet. Known for their sharpness, incredibly speed, and lack of chromatic aberration, you’ll be awe-struck at the quality of the photos. I had mentioned earlier the photo-journalistic aspect of Wedding Photography, well with a Leica (or any rangefinder for that matter) you can take on the role of photo-essayist. 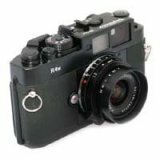 Rangefinders, and the Leica in particular, have supremely quiet shutter releases, so hardly anyone will know that you’ve actually taken the photo. Plus you can focus and fire from the hip so easily that you’ll have an unprecedented ability to grab photos with practically no one noticing. This gives you a lot of creative power as a photography, because you can concentrate on getting the Wedding Party and the guests to behave as naturally as possible. You might think the Leica is overkill (due to its price), but the images will be well-worth it (and if you rent it, the actual expense is minimal). So the camera configuration of two dSLRs and a rangefinder can yield you a wider variety of more compelling photographs with different feelings and emotions captured. That’s what the clients ultimately want, images that define the moment, that will spark memories in the future and will stand-out from the standard wedding photography fare (not that you won’t offer those as well, but it’s always about offering more than the standard these days). 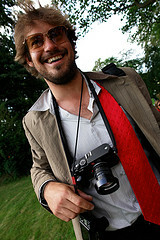 About The Author: Nick Smith is author of Digital Wedding Secrets – a guide solely focused on the wedding photography and its business. If wedding photography is your passion too then Sign Up to its RSS or the FREE Digital wedding newsletter to receive wedding photography tips in your email. This entry was posted in Equipment, Features, General Tips and tagged camera, dslr, leica, photography, photography tips, rangefinder, tips, wedding, wedding photography on June 11, 2010 by Brian Auer. Ok, three things I wanted to share today — all totally unrelated aside from the common ground of photography. First and foremost, this is something worth mentioning, watching, reading, and sharing. I mentioned a few days ago that James Nachtwey would be revealing a project he’s been working on with the help of TED. Today is the day that we all find out what it is, and it’s certainly something amazing. He’s set out to tell the story of Extremely Drug Resistant Tuberculosis (XDR-TB). This is a new and deadly mutation of TB, and it has the potential to kill millions more people. Apparently, 1/3 of the world’s population are infected with dormant TB and can become active due to a reduced immunity caused by other things. XDR-TB results from the mistreatment of TB . TB kills 4,660 people each day — that’s one every 20 seconds. And it costs $20 to treat TB if done properly the first time. Please spread the word. Visit XDRTB.org for more information. I’m not exactly saving the world with this one, but I did save a camera. 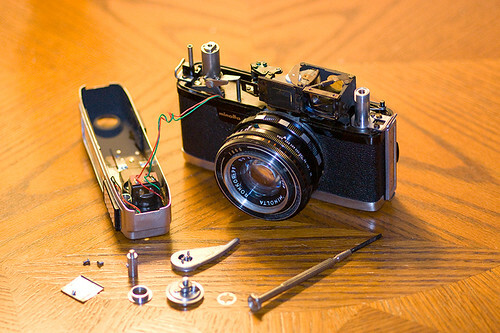 I was just doing a little camera repair on my rangefinder (Minolta AL). When I bought this camera, the rangefinder mechanism wasn’t working (which the seller didn’t tell me because he didn’t know). So I finally worked up the guts to tear it apart and see if I could fix it (after seeing what my buddy Joe is up to with his camera). You can read more about this little adventure on the Flickr page by clicking the photo above. I’m planning on submitting some photos to Alamy over the next couple of days, and I could use some pointers from the stock savvy photographers out there. Take a look through the slideshow below (probably not visible on a feed reader) or visit my Flickr set containing the photos I’m considering submitting to Alamy. I’m not huge on stock photography, but the prospect of selling through Alamy doesn’t totally turn me off (as long as they accept my work). So for that first submission of 10 images I want to make sure I’m not throwing in any duds. The reason I’m looking to get into this is two-fold: possibly make some extra cash to support my photography habit, and make some use out of the photos in my archive that don’t make it through as “art”. At lot of time, stock photos have very different qualities than fine-art photos, and I’m curious to explore that. Some questions I have for you stock photographers… Is b/w a bad thing? As I search through the stock sites, I rarely (if ever) see a b/w photo. Is it best to just submit the color version of the same photo? Or both versions? And what’s the deal with film? Is it really dead to stock photography sites like Alamy? I’m gaining quite a collection of 120 film scans that turn out to be ~50MP without upsizing. Will I just be laughed at if I submit film scans? Or is there actually a slice of the market for this? After I go through the submission process (and hopefully get in the club), I’ll write up my experience with Alamy for those who might be interested in doing the same. This entry was posted in News and tagged alamy, camera, Flickr, james nachtwey, photography, rangefinder, stock, tb, xdr-tb on October 3, 2008 by Brian Auer. Cameras, Cameras, everywhere. Sometimes I feel like we get so caught up in “the now” with the digital age and the boom of the dSLR, that many of us probably forget about all the other cameras out there. I’ve been doing a lot of wandering around on eBay lately (which has already caused me to buy four new cameras) and it’s quite apparent that there are a ton of cameras out there that don’t fall into the dSLR classification. So this is just kind of a fun little post that takes a look at each of the main types of cameras still in use today. Enjoy! The SLR camera is a fairly common sight these days, with digital versions covering every price range from affordable to outrageous. These cameras derive their name from how they’re made and how they work. Single Lens indicates that the camera uses one lens for viewing and recording photos. A series of mirrors and/or prisms direct the light from the camera lens to the viewfinder. The first mirror in the set is called the Reflex mirror, which sits in front of the recording media (film or sensor) and flips up when the shutter is released. Single Lens Reflex cameras typically have removable lenses and offer an array of features and controls — But this doesn’t always have to be the case. SLRs can be found in digital and analog (film) versions. TLR cameras are mainly a thing of the past, especially with the introduction of the SLR. These cameras have a distinct look due to their Twin Lens system. 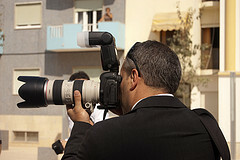 One lens is used for viewing while the other is used for recording the image to the media. The image from the upper lens is reflected onto a viewing/focusing screen with the Reflex mirror. 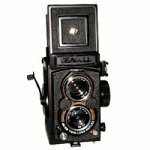 Twin Lens Reflex Cameras (despite their clunky and old fashioned appearance) actually hold several advantages over the SLR. Simpler construction, fewer moving parts, more responsive shutter mechanisms, and sturdy build are just a few things these cameras are known for. Of course, bulkiness, sometimes awkward operation, and the tendency to have fixed lenses are a few things that the standard SLR took care of. Oh yeah, and they’re film cameras (and usually medium format)… at least, I’ve never seen a true digital TLR. The Point & Shoot, or compact camera, is another type of camera that has flourished in the digital age. These little packages are easy to carry around and equally easy to operate. Though the features and controls are limited on many models, the intended use for this camera is not professional work. Most P&S cameras are autofocus and auto meter, allowing the user to focus on the subject. Point & Shoot cameras can be found in both film and digital versions. Most of the old film versions are of the viewfinder type, while many digital compact cameras don’t even have a viewfinder (instead they rely on their LCD screen). While the rangefinder camera has similar characteristics to both SLR cameras and compact cameras, it’s a different beast altogether. These cameras derive their name from the mechanism found in the viewfinder: the rangefinder. A rangefinder is a tool that allows you to judge distance and focus without actually looking through the lens. The major benefit of these cameras lies in their simplicity. They’re small, lightweight, and they contain fewer moving parts than the SLR. UPDATE: As Janne pointed out in the comments, this isn’t entirely true. The actual rangefinder mechanism is much more complex than an SLR camera. Thanks Janne! Rangefinders are famous for street photography, and you’ll find that many famous street photographers use (or did use) rangefinders. These cameras can be found in both film and digital versions, but watch out for those price tags! Some of these cameras (even the film cameras) cost more than professional level digital SLRs — but there are plenty of cheaper options out there… Just don’t start daydreaming about a Leica. 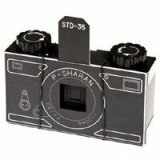 Viewfinder cameras are very similar to rangefinder cameras, but they’re missing one important element: the actual rangefinder mechanism. The viewfinder on these cameras only presents the photographer with a view of the approximate framing in order to allow for composition. Focusing is either something you guess at, or something that doesn’t happen (fixed focus). Light metering is typically non existent also, but I have seen some cameras with meters external to the viewfinder, and others with a meter that attaches to the camera. 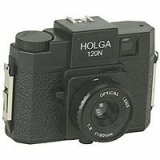 These cameras are incredibly simple, and one of the most well known viewfinders is the Holga, but there are plenty of other cameras out there that are made of metal. Viewfinders can be found in both film and digital versions, but film is more common than digital. The reason being, is that any viewfinder with an autofocus mechanism is actually considered to be a point & shoot. Box cameras are old, and you see even fewer of them than TLRs. 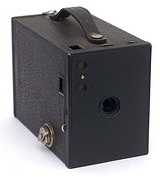 The camera gets its name from the fact that it’s actually a box with a lens. The lens is typically a miniscus lens with just a single element. They’re usually fixed focus, fixed lens, non-metered, fixed aperture, fixed shutter speed, fixed everything. Like I said, it’s a simple camera — it’s basically a souped up pinhole camera. These old film cameras could be fun to toy around with, but don’t expect to shoot a professional gig with one. The most famous of these cameras is the Kodak Brownie. Another blast from the past is the folding camera. These cameras look like something of a cross between the view camera and a rangefinder. The camera actually folds up since it uses a bellows to extend the lens, and everything folds into a nice rugged little case. A majority of these cameras use medium format film, but there are a few 35mm versions out there. These cameras were popular during the early 1900′s, and were probably phased out due to the introduction of high quality viewfinders and rangefinders. Subminiature cameras are somewhat of a gray area, but basically anything that creates images smaller than the standard 135 format (24mm x 36mm) could be considered subminiature. These cameras take film formats such as Minox, 16mm, Super 16, 110 format, and a few others. While the cameras are still floating around out there, the films are getting harder to find (as I just found out since I bought a 110 format camera). The granddaddy of all cameras… the view camera. While not the oldest type of camera, it is one of the oldest types that’s still used today. A bellows separates the lens and the film plane, and the distance and angles between the two can be adjusted. Large format cameras use the view camera setup, and many modern versions are still used today for professional needs. If you think digital photography is an expensive hobby, just do some research on these puppies and the film that goes inside them. OK, so this really is the simplest of all cameras. The pinhole camera can be nothing more than a bunch of folded up cardboard and a piece of film. No lens, no shutter, no aperture, no need to focus, no nothing. 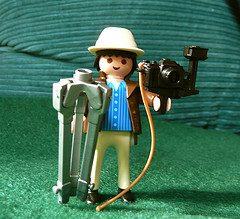 This is something I’d like to try out eventually, but I get the impression that it’s a hobby for the patient soul (ie, don’t expect to go shoot some action photography with one of these). Although native to film, pinholes have made their way into the digital realm with things such as pinhole lens caps. And if you insist that your images must be tack sharp, don’t even think about trying pinhole. I’m sure there are lots of odd little cameras out there from past and present — we’ve really just covered the basic cameras still in use today. I’d encourage you all to try out different types of cameras if given the chance. Heck, maybe even buy some of your own. But no matter what kind of camera you’re using, just remember that you’re still a photographer and you’re still creating a photo — the camera is just a tool. 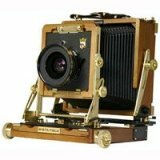 This entry was posted in Equipment, Features, Film and tagged box camera, camera, compact camera, dslr, Equipment, folding camera, foto, photo, photo gear, photography, photos, pinhole camera, point and shoot, rangefinder, slr, tlr, view camera, viewfinder on May 29, 2008 by Brian Auer.